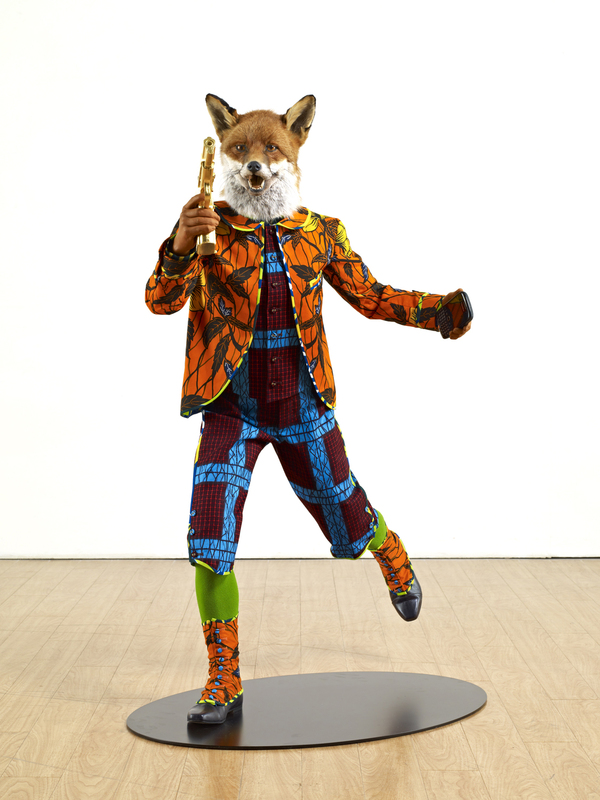 Last week I had the great fortune to be invited to a special preview evening at the Yorkshire Sculpture Park in advance of the opening of a major new exhibition, FABRIC-ATION, from Yinka Shinobare MBE. I have to admit that I’d not heard of London born, Nigerian raised Shinobare before, but I did know one piece of his work – Nelson’s Ship in a Bottle – because it was on the Fourth Plinth in Trafalgar Square, and is now on permanent display in Greenwich. It’s his movement towards the creation of works both for public spaces and for the open air that makes it a perfect time for this exhibition at YSP, and the commissioning of two new pieces of sculpture, which are part of this exhibition and titled Wind Sculptures, underlines this. I loved the fact that he asked the general public what they’d like to see on the Fourth Plinth, and that Nelson now is a recurring theme through his work. In the hours spent at YSP viewing this exhibition, and listening to the curator, I’ve gone from knowing nothing of Shinobare to being a firm fan. The entire collection is suffused with a sense of playfulness and yet the subjects chosen are those of the most serious, from climate change to class inequalities and the historic pursuits of the aristocracy. Revolution Kids, half-human, half-animal sculptures carrying replicas of Gaddafi’s golden gun and Blackberry phones, are Shinobare’s response to the London riots, and convey perfectly the way in which he manages to mix the serious with the playful to create work that is really engaging, and almost comical, yet with a serious underbelly that occasionally has a rather more sinister feeling to it. Food Faeries (about the globalisation of the food market) is a pair of headless sculptures of winged children carrying fruit that really made me shudder a little. Revolution Kid (Fox Boy) Copyright: Yorkshire Sculpture Park. Colonialism, race, globalisation and identity are also recurring themes, and Shinobare uses ‘authentic African’ batik fabric – which was first mass produced in Holland and sold into West Africa in the 19th Century – as a way of confounding expectations. 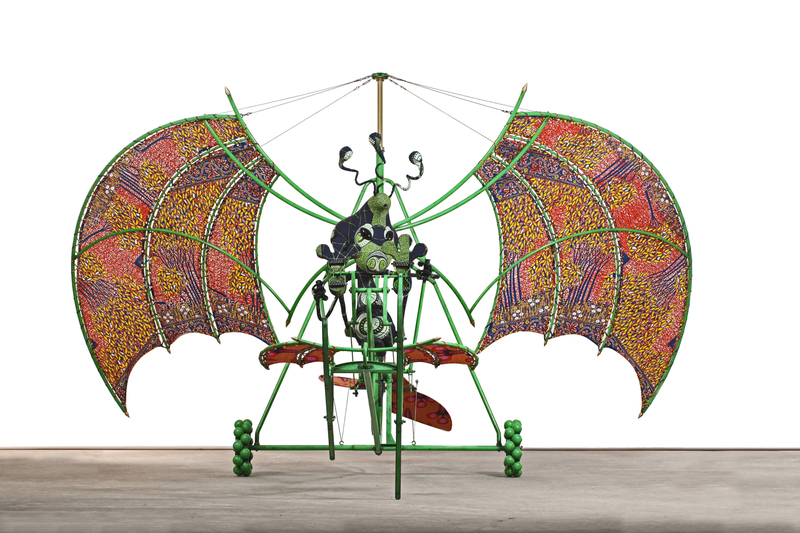 Alongside the thoughts of identity come those of ‘aliens’ – which made me think of refugees and human ‘aliens’, and here Shinobare again turns the idea of alien life on its head, with the inclusion of flying machines more akin to Leonardo’s inventions than what we expect from science fiction. A really diverse range of work is on display from the period 2002 to 2013, including film, photography, painting and collage as well as sculpture, which demonstrates Shinobare’s desire to be impossible to categorise. It feels like a wonderful opportunity to really learn a great deal about his work over the past decade. I truly loved this exhibition and I think that everyone would find something about it to enjoy, whether that is the boldness of the satire, the contrast between the seriousness of the subjects and the fun of the interpretation, or even just the bright colourful nature of each piece of art. The exhibition is at the beautiful Yorkshire Sculpture Park until 1st September 2013 and I will definitely be returning for another viewing of this remarkable artist’s work. Sounds like an interesting exhibition. Not an artist I’m familiar with, but that’s why I adore the YSP, something new every time. Same here. I love YSP so much! so lucky that it’s fifteen minutes down the road from us. And that we have the Hepworth Gallery in town.